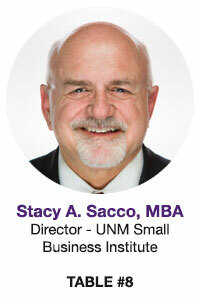 Stacy Sacco serves as the Director of the UNM Small Business Institute, teaches entrepreneurial studies at the Anderson School of Management — which he has done for nearly 20 years — and owns Sacco Connections LLC, a management consulting firm. Stacy previously held national marketing management positions at several Fortune 500 corporations in Southern California, including Avco Financial Services, Hyundai Finance and Transamerica Insurance Group, and locally, the Greater Albuquerque Chamber of Commerce, the CNM Workforce Training Center, Kirtland Federal Credit Union and WESST. Since moving back to New Mexico in 2000, Stacy has published a monthly email connecting nearly 5,000 subscribers to jobs, events and links to over 2,000 local business organizations and resources. Stacy also founded and co-hosts the annual MarCom Mixer that attracts 350-500 members of the 20+ key marketing-related professional associations statewide. Stacy holds an MBA from Pepperdine University and a Bachelor’s Degree in Marketing from the University of Arizona. Stacy will be leading the educational roundtable, Strategic Networking: Maximizing Your Personal and Professional ROI, at Table #8.